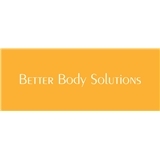 Better Body Solutions (New York) - Book Appointment Online! Patients suffering from symptoms associated with their corporate jobs will have multiple medical specialties at the ready to relieve pain and improve function. Our health team at Better Body Solutions offers complimentary approaches to wellness. We offer natural approaches to health like modern Chiropractic, Physical Therapy, Medical Massage, ergonomic consultations and conventional medical approaches like Trigger Point Injections, Epidurals and Surgical Consultation. Our team currently consists of 11 health professionals and paraprofessionals. Dr. Lacey is incredible. Very friendly, kind, and thorough. I thought I was coming down with a cold and he adjusted my back accordingly. BAM no cold. Staff is fantastic. The office is nice and clean. I love seeing them.